Have you ever seen one of those movies where people try to make this super smart computer that can think on its own? ….and then it tries to take over and starts shutting off life support and other annoying things like that. Doh! Sometimes that happens to me in a way. My brain tries to switch gears on me and take over! Yesterday I decided that I really needed to crack down and finished the baby blanket I was making for my niece’s baby. I ended up feeling bad for most of September and all of October so it had gotten shoved into a corner. Well the baby is a couple of weeks old now and I need to get that finished! So I go to get it and see this tatting thread. This sneaky little thought about tatting something seeded itself in the back of my brain. I fought it! I kept looking for that blanket… my husband had the kids help clean up a while back and their way of doing that is to stick everything in the garage (Grrr!) So I can see it but can’t reach it. Then I found my little box with more tatting things in it and the next thing I know my fingers are googling tatting patterns… completely on their own I swear! I’m thinking……”no, I can’t start something new! I have other things I need to be doing! !” but I already have something started now LOL Bad! I haven’t gotten any sleep yet but I was in bed most of the day. I must be feeling better though because I’ve been up doing laundry and cleaning and thinking about crafts. I wanted a cup of hot tea and wished I had a real tea-pot instead of having to heat water in the microwave. Then I remembered I did have one! I had my tall son, Jared, take it down from off the top of the cupboards so I could clean it. It’s an antique that was one of my husband’s aunts. I never met her but my mother-in-law said that we were a lot alike. She was always telling me about “Aunt Nin”. She told me she liked to get mail so I started writing to her when she was in her late 80’s. I grew to love her and she was always sending me little things like antique postcards that she had saved. They had been mailed so they had neat old postmarks and stamps. Anyway, when she died my mother-in-law brought me her teapot. It has pink roses and heats up and there are 4 matching cups that have the most delicate handles I’ve ever seen. I love it. When I learned about tatting and figured out how to do it my mother-in-law told me that “Aunt Nin” used to do that too. I wish I could have met her. Anyway, today I decided to share a picture of a special box that sits by my spot on the couch. 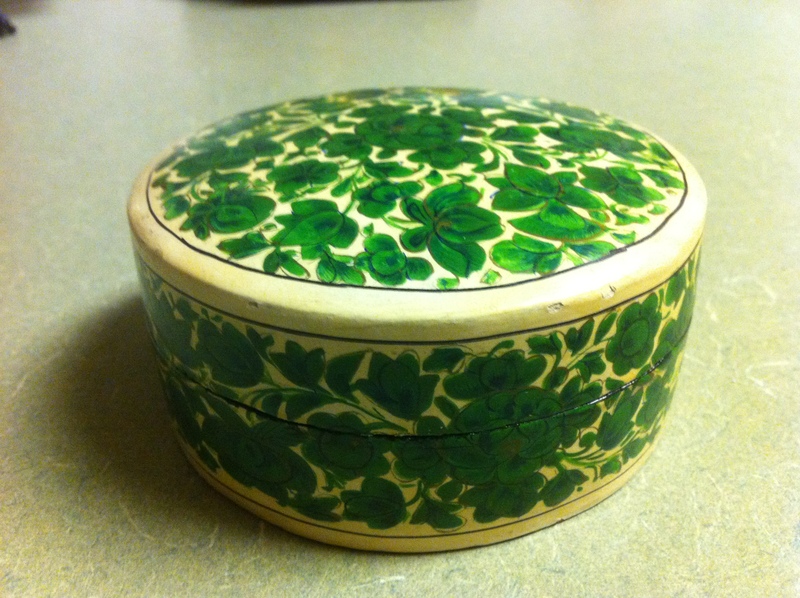 I think it’s probably paper mache that’s been painted with pretty green flowers. The background is an off white/pale yellow and the flowers have a faint gold outline. The painting looks russian to me. I found this box at a thrift store so I don’t know anything about who made it but it looks handmade. I especially like it because they cut a notch in the lid and there is a corresponding V shape in the bottom and it fits together just perfectly. Inside is a set of 8 matching coasters. The coasters are heavier than the box so I think they are actually made out of a light wood. My living room is decorated in greens so it fits in just perfectly. It’s been forever since I actually stewed a pot of tea….nowadays, I tend to use teabags in mugs. Sweet story of how you and your husband’s Aunt Nin were a lot alike and so nice that you were gifted her teapot. Glad to hear you’re feeling a little better now. 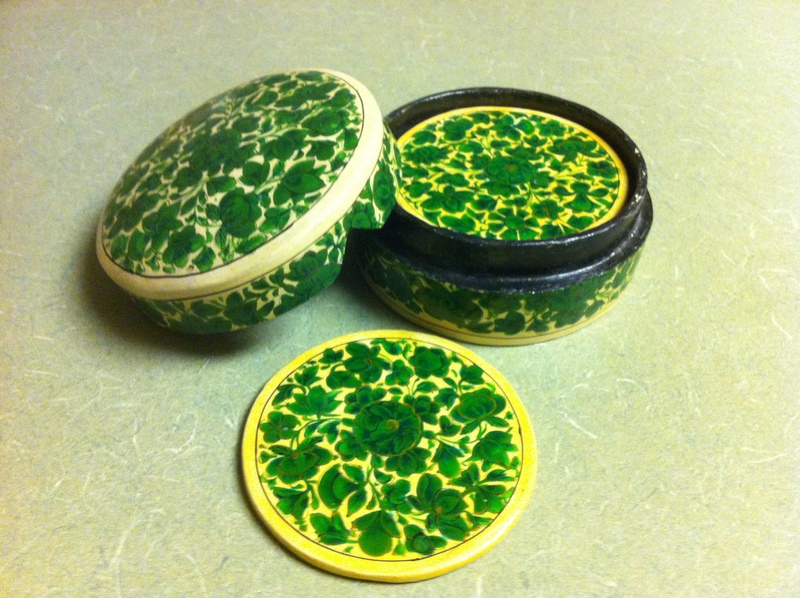 The coasters and box do resemble Russian folk art…not 100% sure though. Pretty colours and design. That is a beautiful little box with the coasters inside. I have no clue what Russian art looks like, so I am no help at all. But they are really pretty and I can imagine they’d go beautifully in a room with greens. Oh I thought of that after I’d already sat down to upload my other pictures and write. I’ll have to take a picture later. I usually take pictures of everything and even in stages when I’m doing things so I’m surprised I didn’t think of that. You know tatting is really not that hard…You’re just doing the same knot over and over and it’s rather relaxing. I’m glad I learned it because when my hands are hurting too bad to knit or crochet I can sometimes still tat. The movements are smooth and short and don’t require a lot of bending the hands or moving fingers. I think what makes it so hard is when people use such thin threads. I use size 10 crochet cotton so it’s not so hard to work with or see for that matter. Some people use thread as thin as sewing thread or smaller.